Duo Bed, king size. Rendered in cherry. Duo Bed headboard detail. Shown in cherry. Duo Bed and Davenport Bureau in cherry. Standing mirror in walnut. Duo Bed. Rendered in cherry with copper panels. The Duo Bed gives you two designs and two beds in one. 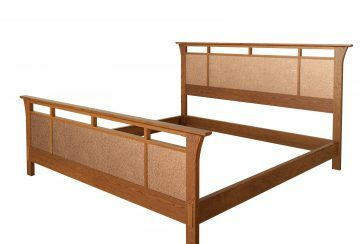 The panels of the headboard and footboard have copper on one face and cherry on the opposite side. Unique hardware allows both the headboard and footboard to be reversible.